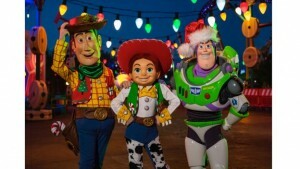 When the holidays kick off November 8 at Disney’s Hollywood Studios, Toy Story Land will be ready for the celebration. 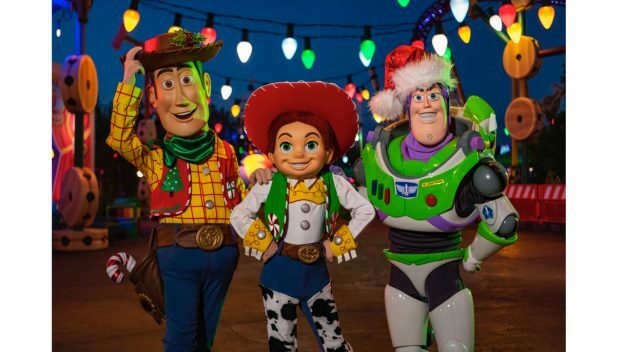 The new land at the Studios will be “dressed up” in new seasonal decor and Buzz, Woody, and Jessie will be donning their holiday best too! Woody will be dressed up in his holiday vest featuring Christmas trees and presents, while Jessie will also have a festive holiday vest in a peppermint patter. Buzz will don his sparkly Santa hat! And, the attractions will also be part of the holiday fun with sleigh bells ringing on Slinky Dog Dash, and two holiday musical tracks featured on Alien Swirling Saucers.